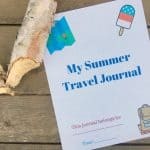 I’ve compiled everything you need to know about hotel travel with kids! Grab these must have hotel hacks before you plan your next trip! Short on table space? I’ve got a hack for that. No budget for eating out? I’ve got that covered too! Read below for all the must have tips. Traveling with kids can be stressful. If you prepare ahead of time you can avoid common pitfalls and ensure your vacation is a success! If you’re planning a trip that includes a hotel stay then this is your all inclusive guide to what you need to know in order to have the best experience and make some amazing memories in the process. As a mom to four kids myself, I have lots of experience with this and I’m ready to spill everything I know. Use these hotel hacks and must haves to plan your next trip, save money and your sanity! #1 – Before your trip even starts you have to start by booking the right hotel! 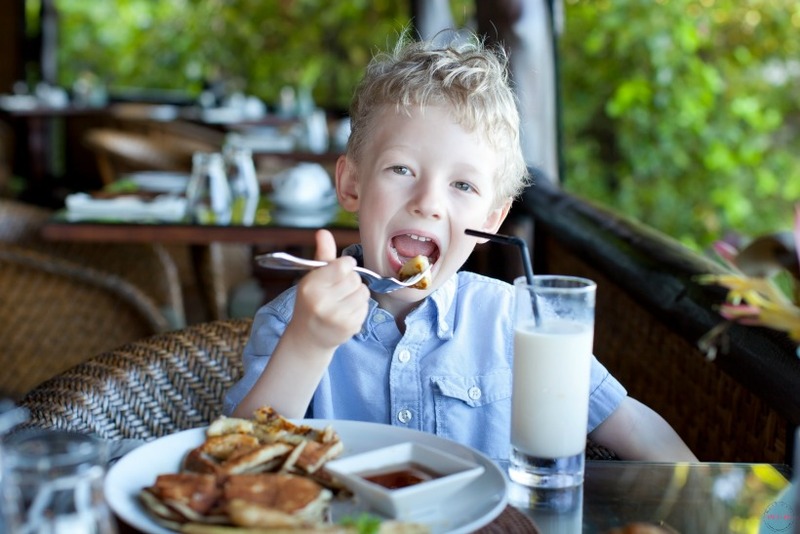 Look for the best hotel for kids in the area that you are traveling to. Not sure where to look? Our favorite hotels to stay at are Howard Johnson Hotels (HoJo hotels). We love them because kids stay free, they have free breakfast, free wifi, pools, most are pet-friendly so the dogs can come along, and they are easy on our budget. They have over 200 locations so there is likely one near you! #2 – When booking your hotel stay be sure to look for special offers or coupons. You can almost always find a great deal by digging around a little bit. I’ll save you some work and plop down a great deal for you right here. Stay 2+ nights at a HoJo hotel and save 20% when you book at www.hojo.com/deals. #3 – Plan your meals. Taking a vacation can be a budget buster if you aren’t smart about all aspects of your vacation. Eating out can be costly, but you can avoid the huge expense by planning ahead a little. Stay at a HoJo hotel which offers free breakfast. This takes care of one meal each day for your whole family. Bring along snacks like granola bars, fruit snacks, chips, popcorn, nuts, etc to snack on during the day. This will eliminate pricey snacks sold at gas stations or other convenience areas. Pack a small cooler of beverages and fruit to bring along as well. If your budget doesn’t allow for lunch and dinner dining out, then bring along a crock pot and use it in your room to prepare easy meals. Be sure to also bring dish soap and a towel for easy cleanup afterward. You’ll also want to bring paper plates and plastic utensils as well as a roll of paper towels. You can also prepare sandwiches ahead of time and pack them in a cooler. This will save a ton on food costs! You can also use the hotel’s coffee maker to heat up water for instant foods like oatmeal and ramen! #4 – Bring trash bags. Kids create a lot of mess and by having trash bags on hand you can easily contain the messes. They work great for wet suits and dirty laundry too! 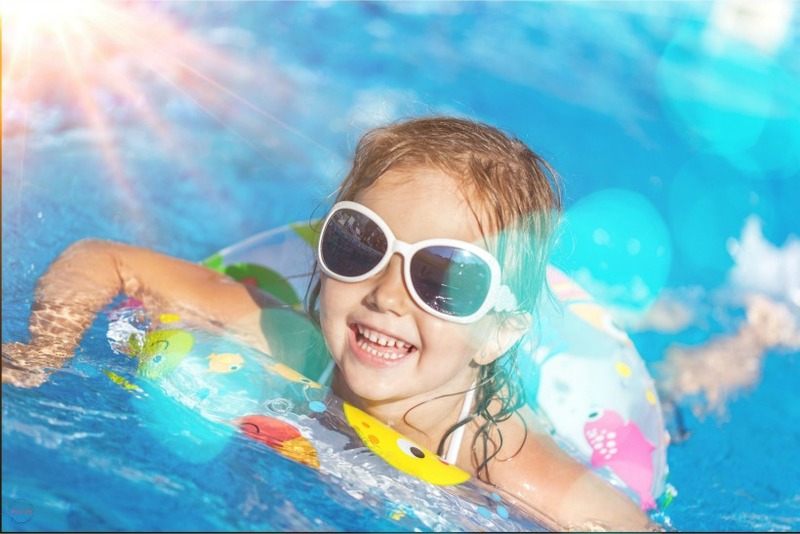 #5 – Make sure your hotel has a pool! My children’s favorite thing about staying at a hotel is swimming in the pool! HoJo hotels all have pools and ensure my kids will have a blast on our vacation. Bring along floaties or a life jacket, goggles, sunscreen and swimsuits. #6 – Plan the sleeping arrangements. If you know your kiddo doesn’t sleep well in a bed with his sibling then bring along a sleeping bag so he can sleep on the floor if needed. Bring an extra sheet to throw on the floor for a clean place to roll around and sleep. For a toddler that doesn’t do well in a high bed you can push together two chairs that have high armrests to create an enclosed bed. #7 – Use the ironing board for extra table space! If you are short on table space for all the kids, set up the ironing board and cover it with a towel to use as an extra table. #8 – Block out noise. Do your kids struggle to sleep soundly in a new environment? Roll up a towel and put it at the bottom of the door to the room to help block any noise from the hall. Bring along a sound machine or use a white noise app on your phone to block out any noises that might keep them awake. #9 – Enlist the kids to help pack their bags. Cut down on the pre-travel work by enlisting your kids to help pack their own bags. 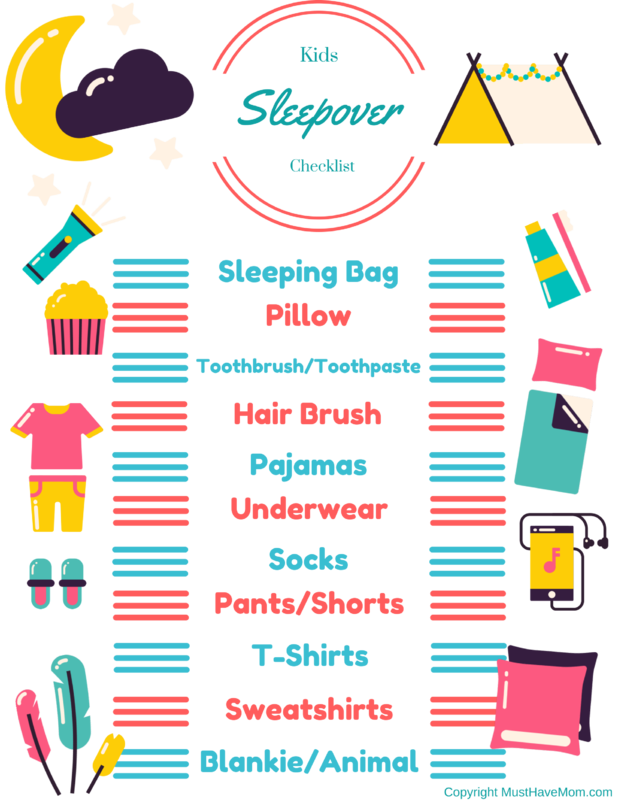 Give them a list of what to pack (try this free printable sleepover checklist) and have them each pack their bags. Give it a quick check over and make sure they didn’t leave anything out (or end up with crazy mismatched outfits). #10 – Don’t have too many expectations. Whenever traveling with kids it is always important not to have too many expectations or over-plan your trip. Go with the flow and it will take a lot of pressure off your vacation. Just have fun and enjoy what activities you can. Let the rest go! I love these tips! Any hotel you stay at has to have a pool if you have kids. 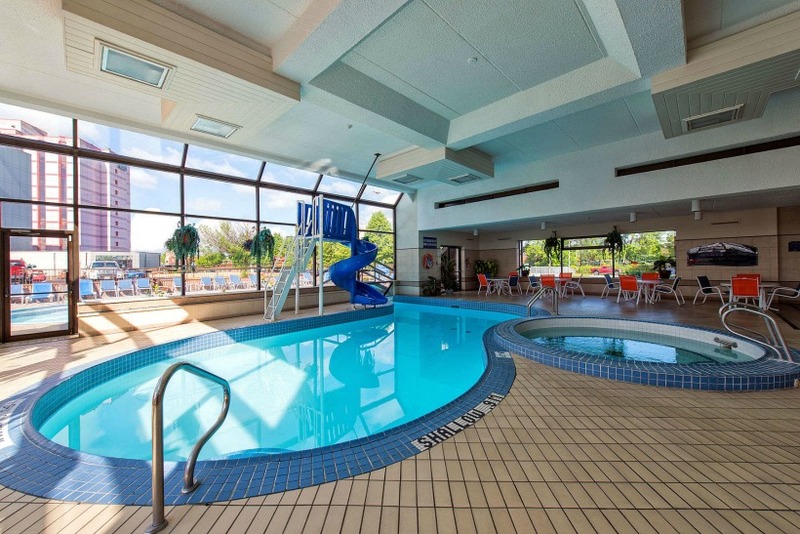 There’s nothing quite like a pool to keep the kids happy when you’re at a hotel. We use gallon size bags to pre-plan outfits by the day- helps cut down on fuss and arguing each morning when we are trying to get out of the hotel door! Oh my gosh you’re a genius! Thanks for sharing that super mom tip! We travel a lot with our kiddos and we do all of this. If there is not a pool I never hear the end of it LOL. It’s great that the kids stay free, that is a major saving. Using the ironing board for extra table space is a good idea, I would have never thought of it. I never have enough room in the hotel trash bins but that is a good tip about bringing your own! I will have to try some of these tips! Yes, you definitely must have a pool! Especially if you are traveling somewhere hot! Never thought about bringing trash bags, but that’s a great idea! I’m always looking for something to put the dirty clothes in! Thanks for the tips! I totally agree with going with the flow and not having very high expectations. Things inevitably happen that make you change your plans and you just need to roll with it. Yes, attitude is everything right? Setting out with low expectations always helps ensure a smoother trip! 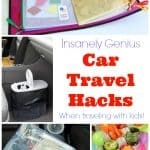 S many great tips and hacks when traveling with kids. I love the tip about rolling up the towel to cut down on the noise. This has really helped us! I hate when the kids get woken up by other guests running down the halls. 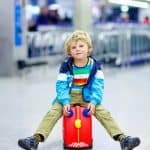 Great tips for traveling with kids. Having trash bags is a really good idea. Booking the right hotel is super important! I love the pics. Thanks for sharing! Bring trash bags. Great tip. Traveling with kids is always fun. These are all great tips. We always look around for the best hotel before booking one. I think traveling with kids can be a lot of fun when things are all done right. 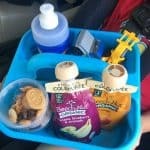 These are great Hotel hacks for traveling with kids. I always make sure the hotel is family friendly. A pool is always a must for us. I love these tips. Hotels with pools and breakfast are for me. The food aspect can be daunting. I know we adults need a break but boy when the hotel has a fridge or complete kitchen, it sure does take the weight off the pocketbook. Yes, that is a huge help! Especially when you have many kids! Your list is perfect for my family. The kids ONLY care about the pool. With them spending so much time in the water, trash bags are a great idea for stashing dirty & wet things. Yes, I always seem to forget them! These are all great hotel hacks. I never thought of using the ironing board as an extra table. My kids also love to check out the pools when we vacation. I really love the shape of the pool featured-too pretty!